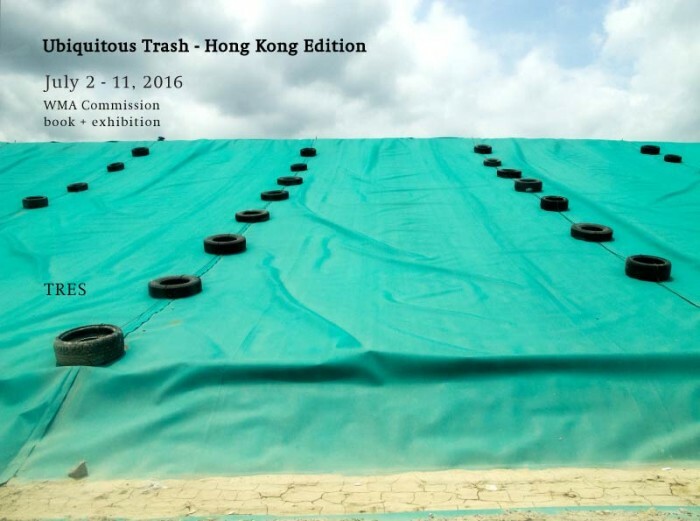 Connecting Space Hong Kong is pleased to support exhibition – Ubiquitous Trash – an exhibition on the process of continual scavenging that depicts the social life of the strange abandoned objects we call trash. Starting with constant walks in Hong Kong, TRES (the winner of the WMA Commission: Waste) explored the signs and marks imprinted on trash collected from public spaces and official waste sites. This scavenging activity, typical of the collective, was then transformed into a book, where the intertwining of public space and trash became the place where a multiplicity of relationships were explored, making clear the socio-political viewpoint from an artistic perspective. This exhibition is therefore a continued iteration of such scavenging process, and as such it has varied the intensity found in the book. TRES presents a journey through the tension between the macro and the micro-details that emerge while translating trash into a photographic image or drawing. In each piece of refuse a gesture is left that allows us to gain insight into human culture. Trash tells us who we are, but it also reveals what we decide to leave aside, out of sight. TRES (integrated by Ilana Boltvinik and Rodrigo Viñas, Mexico City) is an art research collective that has focused on exploring the implications of public space and garbage through artistic practices that concentrate on the methodological intertwining and dialogue with science, anthropology, and archaeology among other disciplines. WMA Commission invites entries for proposals annually from artists and photographers from both Hong Kong and the international community, to create new photo-based work in Hong Kong, focusing on the social theme. A four-member Selection Panel will choose the WMA Commission recipient, who will be awarded a HKD$250,000 grant which will contribute towards production of the successful proposal and a public event featuring the completed work. The call for proposals is open to all local and international applicants. The WMA Commission is a part of the WMA Masters programme.